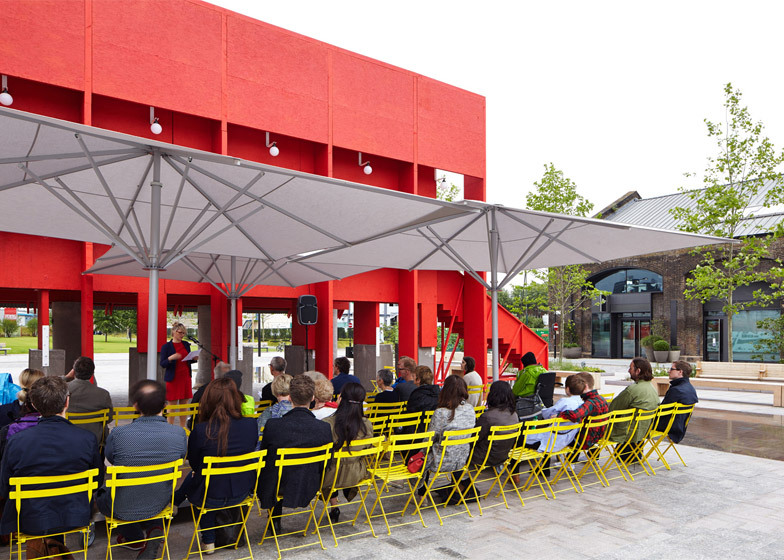 London Festival of Architecture 2015: four architecture studios from Ireland have come together to create colourful pavilions for this year's London Festival of Architecture – a red one containing an elevated passageway and a yellow one housing a library of bricks (+ slideshow). 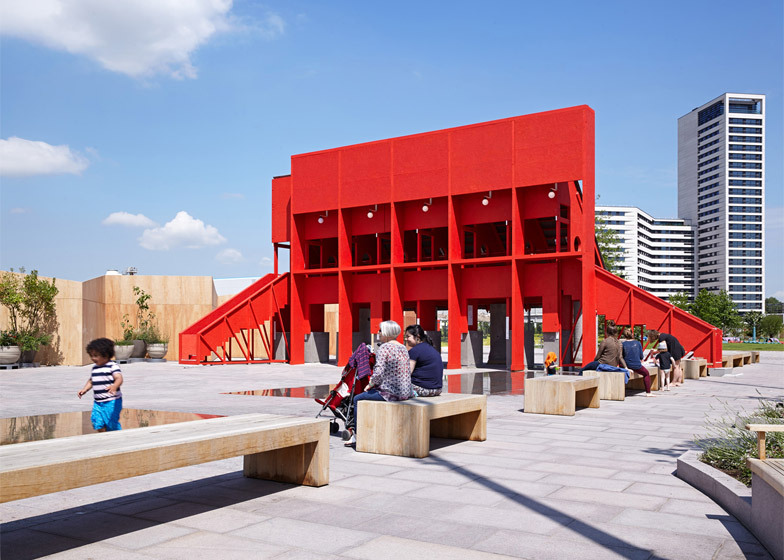 The largest of the two structures is the Red Pavilion, designed as a collaboration between TAKA, Clancy Moore Architects and Steve Larkin Architects, who all share a studio in Dublin. This sits alongside the Yellow Pavilion, conceived by Belfast-based Hall McKnight. Both structures are intended to represent the theme of the festival, Work in Progress, but in different ways. 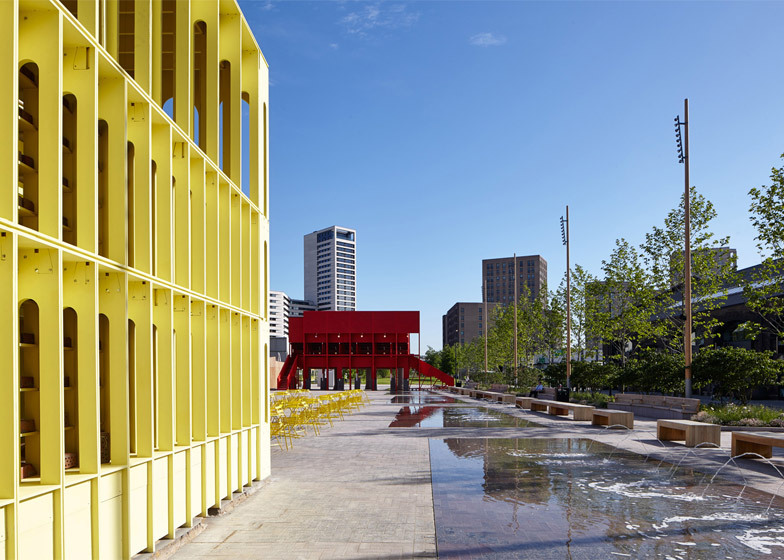 The Red Pavilion was designed as a framework for activity, while the Yellow Pavilion aims to show off some of the components that make up a city. 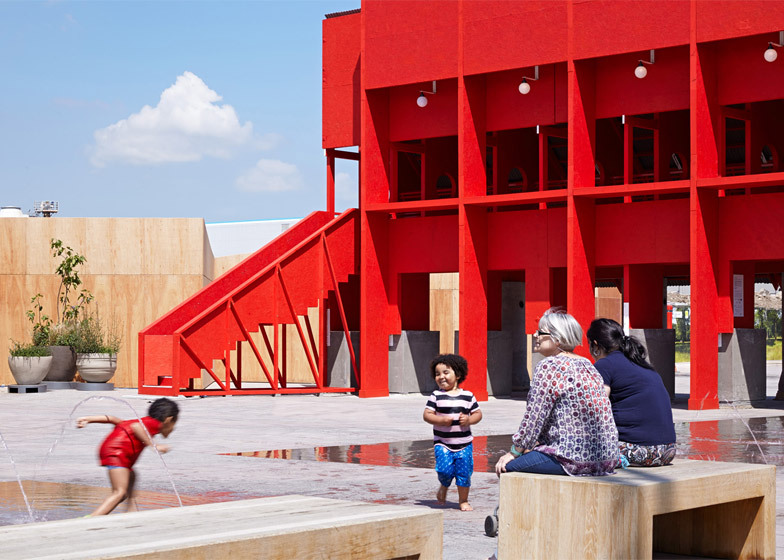 "Embracing the Festival of Architecture theme, these embellishments to the built environment play with preconceptions of labour and pleasure, old and new, public and private, the room and the city," explained project curators Raymund Ryan and Nathalie Weadick. 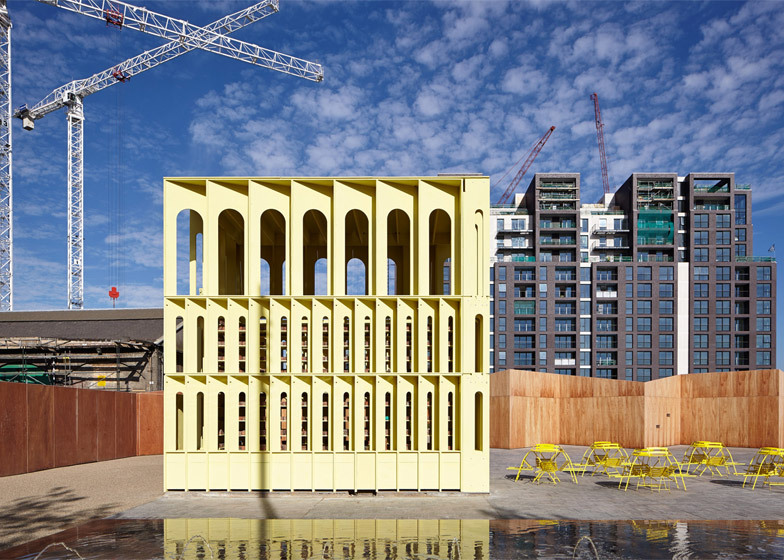 The two pavilions have been installed in Cubitt Square – part of a huge development zone near King's Cross Station – for the duration of the London Festival of Architecture 2015, which runs throughout June. The Red Pavilion stands at the northern end of the site. Its form integrates chunky concrete columns, a house-shaped colonnade, circular windows, a repeating facade and a narrow elevated walkway. 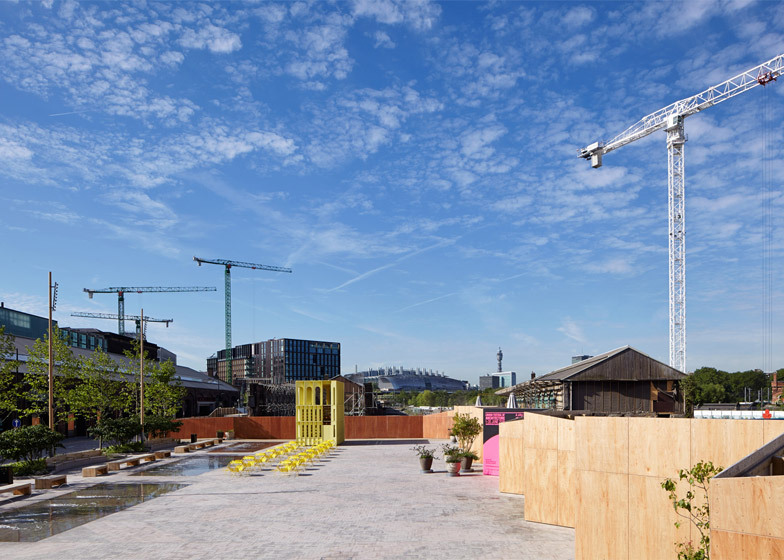 "We see the pavilion as a contributor to the work in progress at King's Cross," said Steve Larkin. "[It is] a kind of temporal elevation briefly establishing relationships between the new city spaces that will give way to the more permanent buildings currently being constructed." The structure was built with a timber framework and walls of oriented strand board – a type of panel engineered from wood chips. 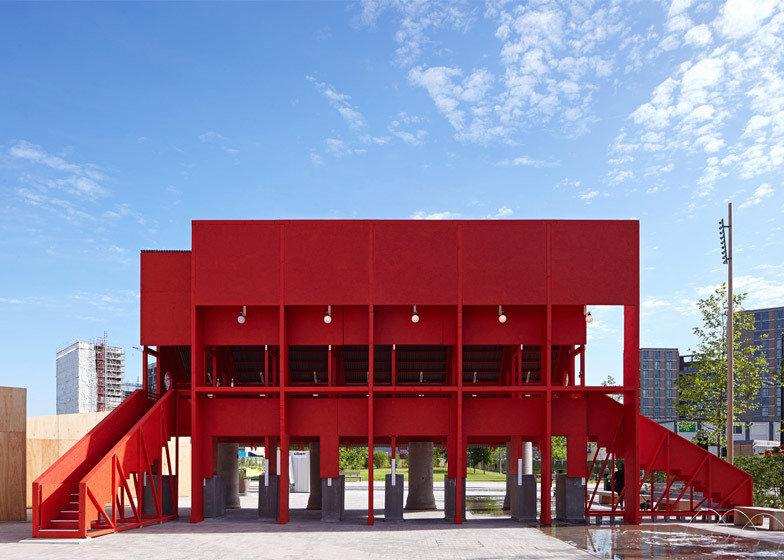 Everything is painted red, apart from the concrete columns around the base, provoking comparisons with Jean Nouvel's 2010 Serpentine Gallery Pavilion and the many structures in Bernard Tschumi's Parc de la Villette. Visitors enter the pavilion by climbing either of the two staircases, which stand at opposite ends. These both lead up to the elevated walkway, which runs alongside a series of curved seating booths. Lights overhead reference streetlights, while the seats themselves mimic some of the city's traditional park benches. 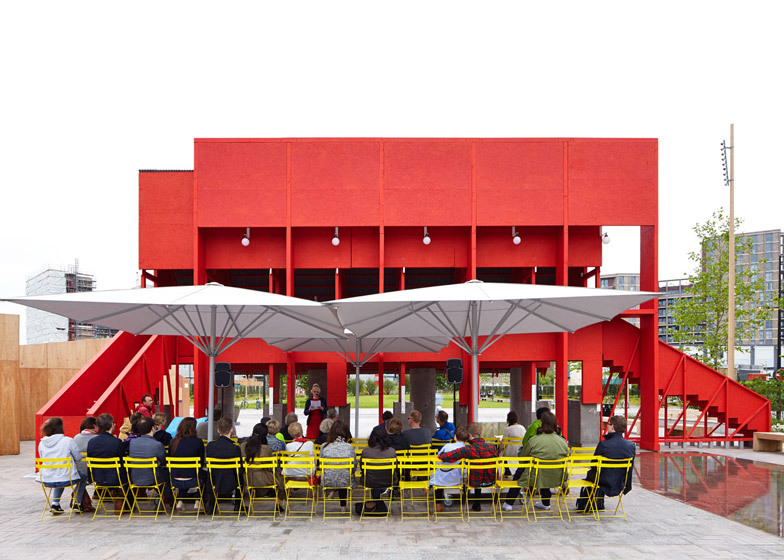 "The pavilion emerges from an observation that all cities are a collective work in progress – this is their permanent condition," explained Andrew Clancey and Colm Moore, the two founders of Clancy Moore Architects. "We also saw an opportunity to work collaboratively with close friends, to explore so many conversations we have had through a collective project," they said. "We believe the city needs multiple voices for vitality. So the working process of multiple voices on the pavilion has been really important," added TAKA's Alice Casey and Cian Deegan. 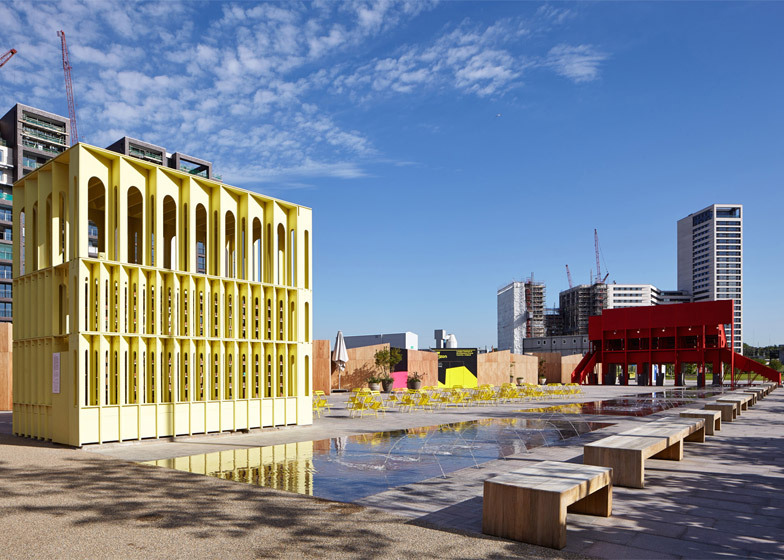 A few metres away, the Yellow Pavilion is a smaller and more rectilinear structure. Its facade is a grid of angled panels, each integrating a tall arched window, while its entrances are openings that extend from the ground to the roof. Inside, its gridded structure becomes a shelving unit displaying a library of bricks – all sourced from one street in Belfast. 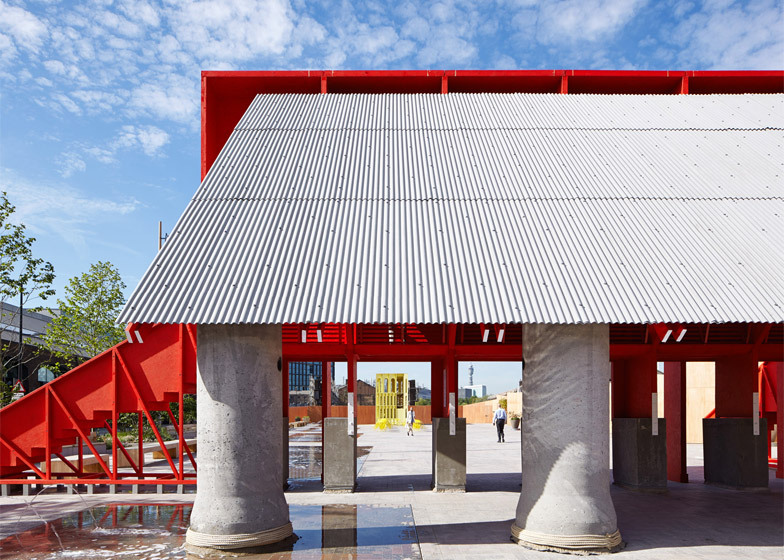 "The pavilion is a vehicle to carry a collection of bricks that speaks of the city as a work in progress," explained architects Alastair Hall and Ian McKnight. "In this sense the project is not ours. It belongs to the city and, just as the city is a collection of many projects, made by many, both the bricks' characteristics of individuality and collected cohesion are expressed." "The bricks have already had a life in a terraced street in Belfast – now they have another life as they are modified and worked with," added the duo. Collectively named New Horizon, the project forms part of a year-long programme of events backed by the Irish government, entitled Irish Design 2015. An exhibition of furniture from both sides of Ireland's north-south border was presented in Milan in April, and later this year installations will be created for the Chicago Architecture Biennial and the Shenzhen/Hong Kong Bi-City Biennale of Urbanism/Architecture. "Ireland's creative output has long been framed by literature, music, theatre, filmmaking and art yet these represent only a fragment of the breadth of Irish creativity," said Karen Hennessy, chief executive of Irish Design 2015. "New Horizon writes a new chapter in Ireland's creative story, presenting a selection of Ireland's most exciting architectural practices."